Letting go of a relationship is one of the hardest things to do in life. No matter what the reasons of splitting up, art in letting go often is not easy to do. Regardless of the situation, it could be that one has its way, a boyfriend or girlfriend, spouse, first love or unrequited love. Letting go of what’s over is usually a very difficult thing to in act and the pain can often continue for years if a person merely won’t break the hold. Moving on from the hysterical anguish and pain is no easy task. Once love if found, as we would expect love will last forever. Yes! It’s great when it does but when it doesn’t, the pain and hurt can be demoralizing. What’s more even demoralizing is the suffering and the anguish the person live through from not moving on of what’s vanishing. Forgetting is not like turning off the light, absolutely another different story for there have been no plug to unplug therein. When a relationship finally ends, it does not mean that feelings move away and flown by the wind. Being alone with the sentiments of loneliness, emptiness, grief, anger, despair and rejection can corroborate to be devastating. To that, external forces controlled the anguished heart thus trigger to contact other people, create up reasons to be where on earth the person is, calling them continually, etc… Any kind to keep in touch with other person or have some attachment and hold with them. Even as its natural thing, we want to do, but this just prevents us from being cured in the relationship. 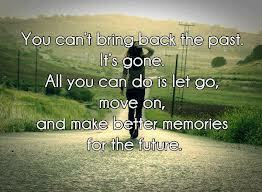 For us to let go and live again, we have to close the past even if it hurts so much. It is impossible to bring back the past. For doing, this will just closed your door to look forward on what’s ahead in the future. What had happened is over, and please don’t we presume for some amount of waiting, wishing and wanting for regret will not undo the whole thing nor changed whats’ already been written. Really well written. The only thing you can do is look forward to the future. Thanks for sharing such wise words and for the follow. Take care. All the best from Marseille, France. haha.. Very well said… I wish to have a slice of chocolate cakes too! We both deserves to have one… So let’s enjoy this slice of happiness. Agree?